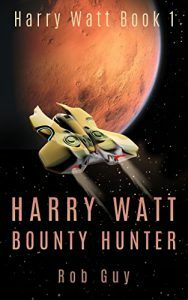 For Harry Watt, Bounty Hunter, simply doing what he’s told was never an option. When the best hydrologist on Earth goes AWOL after first helping himself to some company funds, Judge Headlock, Harry’s employer and nemesis, instructs him to bring back the runaway to face justice. A trip to Mars onboard one of the new ships with the StrateLine Drive sounds like fun, but Harry soon discovers something stinks about this job, and it’s not one of his socks. He realizes he must first travel to Venus Station, but it’s not easy to be in two places at once. And getting framed for murder doesn’t help matters. So with the help of his dead partner, an erstwhile assistant, and a host of lady friends, Harry embarks on a rip-roaring ride through the Solar System in a bid to prevent a Martian civil war, and maybe earn a few credits along the way. Targeted Age Group:: Adult only. I have been interested in science fiction and space travel since a young boy. Growing up with the Apollo moon missions helped I suppose. In school, when asked to write fiction during English class, it was always science fiction for me. I never considered writing anything else. Fiction can take you anywhere, the limit is your imagination, but science fiction can take you so much further. To the stars and back! I also enjoy comedy. So to combine the two genres of SF and comedy seemed like the perfect mix to me. Harry Watt started out as a bit of a hapless character. He is an interplanetary bailsman, but regards himself as a bounty hunter. I wanted to create a character that was both heart warming, and also a little ruthless as well, but only to the wrong sort of people. But he can't do his job alone. All good cops need a sidekick, as well as some desirable females into. Then you have to place them in awkward and unusual situations, which require any number of strange and diverse characters. I had great fun accomplishing this. Harry knew this was not good. He barely had time to wake Heidi when the door to the bedroom was flung open and several storm troopers, clad in full riot gear, filed in, rifles raised, ready for anything. The first one stopped short on seeing Heidi rise up, bearing all above the waist, and the others all ran into the back of him. The result was a pile of mumbling and fumbling bodies that blocked the doorway. Behind them the lieutenant cursed their ineptitude and pushed past them into the room. “What is the meaning of this?” Heidi demanded. “Ha!” said the lieutenant. “As if you didn’t know.” He strode further into the room, his tight neoprene uniform squeaking. His men had managed to get back up and arrange themselves in a neat semi-circle behind him. Their guns were trained on the bed, but Harry was standing to the side. Heidi had by now pulled the sheet over herself. The lieutenant whacked the nearest trooper with his nightstick and all guns moved to the left. “Ha! As if you didn’t know,” the lieutenant repeated, throwing back his head. “Is that all you can say?” said Harry. Heidi looked up at him, her mouth open in surprise. Harry squeezed her arm, which told her everything. Leave this to me sweetness. This is my department. “You will be silent,” said the lieutenant. He was tall and lean in his pressed black uniform and peaked cap. The only things missing to complete the archetypal villain look were a monocle and scar across one eye, and/or possibly an eye patch. But his theatrics did not fool Harry. He already had the measure of the man. “Absolutely,” said Heidi. She returned the gesture, which was all Harry needed to know that he had been given the green light. Heidi pulled the sheet to her mouth and giggled. The soldiers started looking furtively at each other through their riot helmets. Who was this guy to speak so cockily to their lieutenant? “I deny myself little when it comes to pleasure,” said Harry cryptically. “Well, risible certainly, I like to think” said Harry as calm as you like. Heidi’s body was shaking with the attempt to prevent herself from committing all out laughter. “Ha! You and your fancy words.” Gruber walked over to a bookshelf and ran a gloved finger along the wood. “Is there anyone else in the room?” he said, staring intently at the end of his fingers. “Look behind you,” said Harry. First lieutenant Gruber spun round, poised like a mantis, karate chop at the ready, only to be confronted by the wall. That did it. Heidi collapsed back onto the pillows, laughing her heart out. A short story entitled A Pisa The Action.